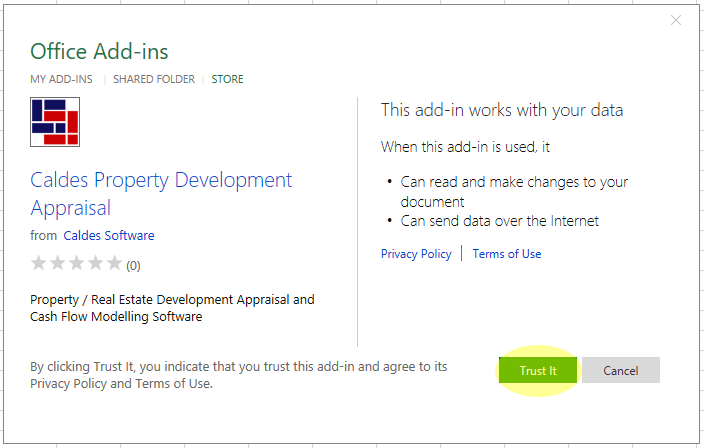 ​​Caldes V8 Developer is available as an approved product direct from the Microsoft Office Add-In Store. For PC you must have Excel 2013 or later (2016 recommended). For Mac you must have Excel for Mac version 15.19 (160206) and OS X v10.10 "Yosemite" or later. NOTE: For an iPad, see the Developer Manual. You will need either a Mac or PC too. To install the Add-In, open a blank Excel workbook. Microsoft keep changing where the store is, so the best way to find it is to search Excel for 'Add-in'. You should see 'Insert an Add-in'. Click on this. It should then pop up in a new window as C2 below. If you see a white header bar then you have an old version of Excel and you should update to the newer service pack before continuing. We recommend that you upgrade to the latest version of Excel, which is 2016 or later. In the pop up window, select 'STORE'. In the search box, type 'Caldes' and then press return. You should see the Caldes Office Add-In listed as per the image below. Double click on this. The office store can be a bit temperamental, especially older versions of Excel. If there is no 'Store' button between 'Pictures' and 'Recommended Charts' then you will need to add this service. To do this, go to File -> Account -> 'Add a service'. You will need a microsoft account to do this. If your software is run by an IT department then you should contact them if you do not have an account. If you still cannot see the store, try going to https://store.office.com instead. If the page is blank, clear your browser cache and then restart your browser. 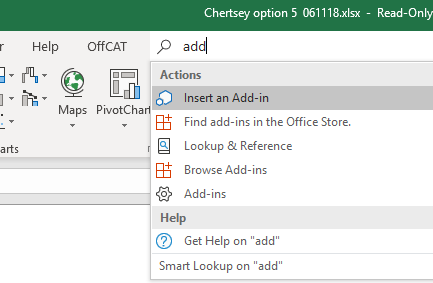 If you still cannot see the store, try going to Excel -> File -> Account -> Connected Services and connect to the store that way. Also try logging out of your Microsoft Account completely, restart your computer and log back in. Also check with your IT department. Some block access to the office store. C3: You should now see a summary of the Add-In. Click 'Trust It' (Or 'Add' if Excel 2013). C4: You should now see a panel open up on the right hand side of your Excel page as per the image below. If the panel opens up but shows an error, try adding any other App in the store. If there is only an issue with Caldes then contact us. If the license does not stick we may need to reset your password. If they all give the same error try logging out of your Microsoft Account completely, restart your computer and log back in. This fixes most issues. C5: When you want to use the Add-In, just go back to 'My Add-Ins' (as per the image point 1) and it will be listed without searching. See the manual for more information.